Smoke rises from the battleship USS Arizona as it sinks during a Japanese surprise attack on Pearl Harbor, Hawaii, on Dec. 7, 1941. 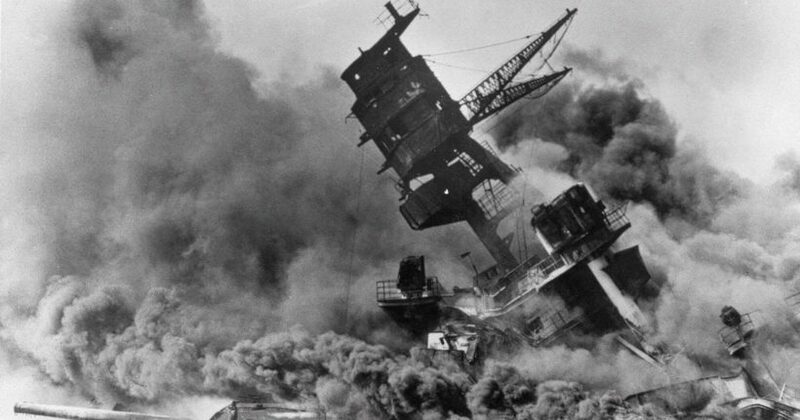 (by the New York Post editorial board) – It’s the 75th anniversary of the “date which will live in infamy,” the early morning peacetime attack on Pearl Harbor that in just 30 minutes claimed 2,043 American lives — a one-day death toll that would not be exceeded until 9/11 — and unleashed a war in the Pacific that would kill millions more. This is likely the last milestone commemoration of Pearl Harbor: The few remaining survivors are all well into their 90s. All too soon, Americans’ last first-hand links to The Greatest Generation will be gone. But Americans should never forget what happened on that bloody day: the perfidy, the tragedy and, most of all, the bravery and unbelievable heroism. America suffered an undeniable military disaster: Japan had hoped to wipe out our naval capability before the war had even begun. That it didn’t is only thanks to the fact that no US aircraft carriers, the prime target, were at Pearl. Still, the Japanese sank 18 ships — most notably the USS Arizona, which lost nearly 80 percent of its crew of 1,511. Even today, oil — dubbed “black tears” — still leaks from the ship’s remains, which have been turned into a somber but stirring memorial. The treachery of the attack, and the huge losses suffered, stunned Americans — but it also unified and galvanized them into a grim determination to persevere at all costs until total victory was won. The nation saw much the same immediately after 9/11 — but, unlike Pearl Harbor, that unity was short-lived. So, as we pay tribute to the heroes of Dec. 7, 1941, let us all remember also how America pulled itself up from that dark day and secured the ultimate revenge: victory. Published December 6, 2016 at The New York Post. Reprinted here on December 8 for educational purposes only. 1. The purpose of an editorial/commentary is to explain, persuade, warn, criticize, entertain, praise or answer. What do you think is the purpose of this editorial? Explain your answer. 2. Tone is the attitude a writer takes towards his subject: the tone can be serious, humorous, sarcastic, ironic, inspiring, solemn, objective, cynical, optimistic, encouraging, critical, enthusiastic… Which word do you think best describes the tone of this editorial? Explain your answer.